In comparison to other poultry species, little is known about how turkeys were originally domesticated. What is known is that wild turkeys are indigenous to the Americas and were kept by Native Americans centuries before the arrival of Europeans. Various tribes ate turkey eggs, as well as enjoying turkey meat, both cooked fresh and dried as jerky. Spanish explorers of the early 16th century brought turkeys to Europe, where the birds were selectively bred for a couple of centuries before being returned to America by early settlers. Those European-bred turkeys were the foundation for the industrially produced broad breasted supermarket turkeys we know today. The broad breasted strains were originally developed from early turkeys like those accepted into the American Standard of Perfection in 1874 — Black, Bronze, Narragansett, Slate, and White Holland. 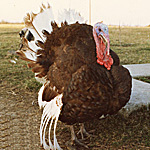 To distinguish them from industrial broad breasted turkeys, these and several other early strains are now designated as heritage. The Livestock Conservancy maintains a list of heritage turkeys, including some that are not included in the Standard. Heritage turkeys don’t grow as large as the broad breasted strains, making them more suitable for a small family with limited refrigerator and oven space. On the other hand, if you’re into white meat, the breast of a heritage turkey is about half the size of that of a broad breasted strain. The heritage turkeys are better foragers and have greater disease resistance than industrial strains, making them more appropriate for raising on pasture. On the other hand, they grow at a much slower rate, finishing in 6 to 7 months where the broad breasted strains are ready to harvest in 4 to 5 months. A heritage turkey meat project therefore requires an extra two months of labor, but the reward is juicier, more flavorful meat. Finally, should you decide to keep your best tom and a few of your hens so you can raise poults (turkey chicks) of your own, be aware that broad breasted strains cannot mate naturally because they are too awkward due to their enormous weight and outsize chests. Propagating a broad breasted strain requires artificial insemination. By choosing to raise heritage turkeys you help support the breeders who maintain and conserve the genetic lines of these endangered native American birds.